The following story was sent to us by Bhawana Baijal. I had organised the story telling on "Paplu the Giant" on 7th Sep 2013, for which an advertisment was published in Times of India on 6th September 2013. 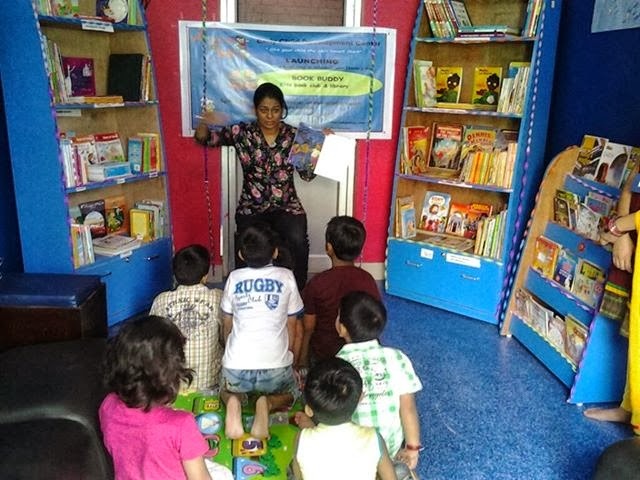 The event was organised on occasion of launch of kids library .This event was inaugrated by honorable Dr.Sarvendra Vikram Singh -Director State Council of Education Research and Training (SCERT). Who to our surpise was associated with Pratham books translation and gifted some Pratham books for children as well. The basic idea of a Giant`s story was very thrilling for the kids,around 30 kids were present on the occasion. I myself delivered the story with dramatisation effect.started by asking them how they would feel if they became giant for one day and got funny answers . kids also questioned ... why Paplu`s mother left him, at the end we had a quiz with book as prize, also we made a circle and passed the book with every child saying "hello Paplu you are my new friend " looking at Paplu`s Picture on cover. It was simply amazing experience for kids and myself.